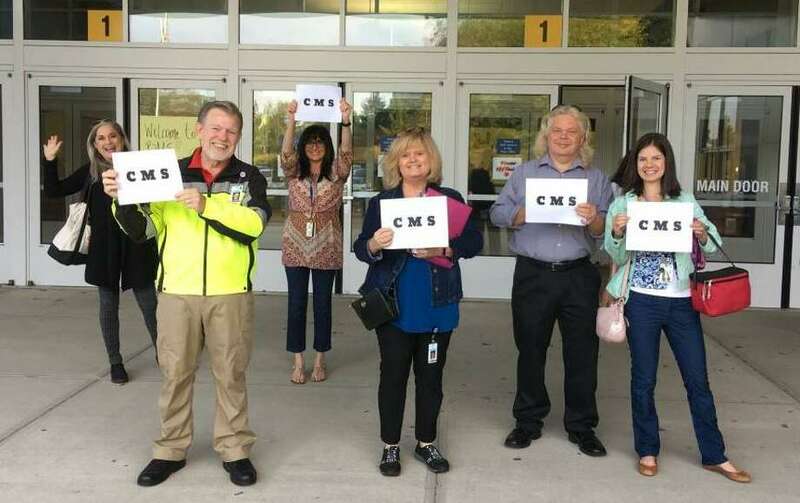 Westport Superintendent Colleen Palmer posted a photo on her Twitter page of Coleytown Middle School faculty and staff welcoming Coleytown students to their relocated campus at Bedford Middle School on Sept. 24. Westport Superintendent Colleen Palmer posted a photo on her Twitter page of Coleytown Middle School faculty and staff welcoming Coleytown students to their relocated campus at Bedford Middle School on Sept.
WESTPORT — After ongoing mold issues prompted the relocation of Coleytown Middle School students to other town schools last week, students, teachers and staff have said the transition has gone smoothly so far. Starting on Sept. 24, Coleytown’s approximately 300 sixth- and seventh-graders were relocated to Bedford Middle School, while approximately 150 to 160 eighth-graders were moved to Staples High School, where they took over the school’s world languages wing. At a school board meeting Sept. 17 featuring a parental uprising regarding concerns over the school’s persistent mold problem, Superintendent Colleen Palmer said she saw no reason to close the over 50-year-old school. The following day, however, a rise in absences and continued parent concern prompted Palmer to close Coleytown for the week. In a tweet on Sept. 20, Palmer called for a plan to relocate Coleytown’s students to other Westport schools, which the Board of Education consequently approved. “Feedback from all of our students and staff is that it’s going really well. All our professionals are working together to keep students needs at the forefront,” Palmer said. In order to move the Coleytown students, administrators had to prepare new teacher schedules, train staff in security measures for each of the schools, and relocate all necessary infrastructure, such as copiers and telephone lines, to the new school, Palmer said. “We can put ourselves in our colleagues’ shoes, so we’re trying to treat our guests as if we would want to be treated. We are all impacted to a different degree. Those of us who are less impacted by the changes are helping out colleagues by changing spaces to give everyone optimal possibilities for instruction,” Staples High School world languages teacher Enia Noonan said. With the relocation underway, the challenge of managing environmental concerns at Coleytown remains. Initial air quality and mold tests of Coleytown conducted on Sept. 19 by the Stamford-based Hygenix Inc. show the majority of Coleytown tested within the clean building range for mold and air quality. However, three rooms and the gym had airborne counts that did not satisfy the clean building criteria, according to a Sept. 21 report. “I guess it’s relatively good news in that the vast majority of the rooms they tested were clean, looked good, and the counts were higher in only three or four rooms,” Westport Weston Health District Director Mark Cooper said, noting he passed the Hygenix report to a hygenist at the state department of health for further analysis. “We have a full-court press to have a resolution of this,” Palmer said. She said her administration has signed a contract with the Mount Kisco, N.Y.,-based architectural engineering firm KG&D Architects to create a report of recommendations to address the moisture and any other environmental concerns at Coleytown. The KG&D report is expected in about a month. With that information, the administration will seek funding from the town and go out to bid for a vendor to work on Coleytown with the goal of permanently remediating the school’s environmental concerns by summer 2019. Concurrently, the administration is speaking with the Occupational and Environmental Medicine Department at the Yale School of Medicine about an assessment of Coleytown. Yale gave them an estimate of four to eight weeks to produce the report, Palmer said.